One thing I struggle with is pants. Finding dress pants that fit well that is like trying to find a needle in a haystack. If I had my way, I would order these Vince trousers and call it a day. I've heard that Vince is the best for fit and I love well tailored pants with a skinny ankle. I ended up walking into Loft and trying on every dress pant option they had. I ended up with these. They fit well, everywhere. They're a skinny fit with a cropped ankle, which is preffered. Although I would like to try a flare. And they come in new colors each season, which I love as I honestly don't wear a lot of black, I'll get so much more wear out of navy or grey. I paired the pants with this t-shirt. 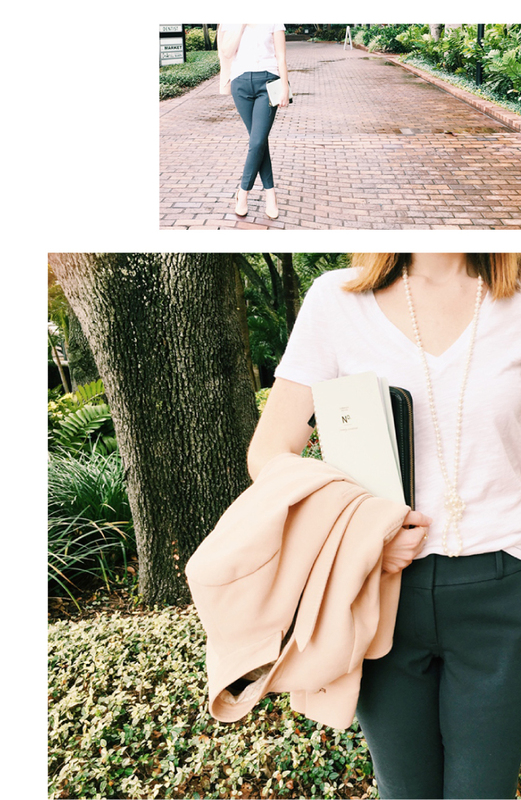 It's just a simple v-neck, but I added my favorite blush blazer, a string of pearls, and block heels. My office is freezing, so I wear this blazer maybe twice a week and it's perfect. It's suede, but I feel like the light shade makes it summertime acceptable and it keeps me warm throughout the day. It also pairs well with all neutrals. If I wear a heel, it's almost always a chunky heel and texturized in someway. I love suede, velvet, mixed textures... It's a fun element to add to an outfit! And the pearls are costume jewelry given to me by my mom and I've worn them with everything from t-shirts to dresses. These things made a simple white tee work appropriate. I love dressing up, but somedays working a bit of comfy and cute into the mix is necessary. If it's one thing that I'm a stickler about, it's my skincare routine. I used to have really problematic skin. Like it was acne prone, breakouts all the time, both oily and dry... It took a long time to figure out how to balance it! Products come and go, but the three things that have really evened out my skin are consistency, light and unscented products, and healthy eating. I wash my face in the morning and at night. This is different for everybody, but I wash it in the morning to remove the night time moisturizer and then again before bed to remove makeup and/or my daytime moisturizer/SPF. Doing this has worked miracles alone. The lighter, more natural, and unscented the product, the better my skin will react to it. I have super sensitive skin and anything too heavy or harsh will break me out. Sometimes you have to go against the grain, one of the most well known skincare brands, Neutrogena, was one that I used for years. They're great! So I used them, but they were too harsh for me and were actually breaking me out, I never realized it until I [ finally ] switched to a gentler product line. And honestly, eating healthy is so great for your skin. I really enjoy healthy foods, but if I do a bad and eat pizza and ice cream like all weekend, my skin will react. Everything in moderation. Garnier SkinActive Micellar Cleansing Water | I love micellar water! I use this to remove my makeup before I cleanse! It really breaks down my makeup and removes eye makeup as well! It does make your skin feel oily but when it dries, your skin feels so soft! Lancome Bi-Facil Double-Action Eye Makeup Remover | This is a bit pricier, so I usually won't purchase this for myself, I use it when I get a sample here and there, but I included it because it does a really amazing job at removing mascara while being gentle on your eyes! Origins Checks and Balances Frothy Face Wash | This is my absolute favorite face wash! It's gentle, makes my face feel clean without feeling dry and I love how frothy it gets! Origins has been great for my skin! I'm on my third repurchase and I can't wait to try more products! Origins Clear Improvement Active Charcoal Mask to Clear Pores | I use this mask about once a week and it makes my skin super soft and really draws out a lot of what's clogging my pores! I actually bought the travel size last time (it was in the checkout lanes at Sephora) and it's lasted me quite a while! Mario Badescu Aloe Vera Toner | Game changer! Using a toner has been one of the biggest steps to changing my skin! I use this both in the morning and at night after cleansing and it's cooling and light. Mario Badescu Aloe Moisturizer SPF 15 | This is my day time moisturizer, which also has SPF in it! It's really gentle and feels good on the skin. This and the moisturizer are the only two products I've tried from Mario Badescu, but I think this is a great brand that doesn't irritate! Cera Ve Facial Moisturizing Lotion PM | This is my night time moisturizer! I love this! It's water based, so it's not the thickest, but it's super hydrating and cooling. I love putting this on at night. And honestly, my skin type has changed from combination to more dry I think, so this has helped keep it hydrated! Origins GinZing Refreshing Eye Cream | Another Origins product! I use this daily! It's great for making you look more awake and adding a bit of brightness! Murad Rapid Relief Acne Spot Treatment | My saving grace! As soon as I feel as spot coming up under my skin or even if it's already surfaced, I put this on and it brings the swelling down or makes it disappear altogether (depending on how quickly you catch it)! Can't live without! These are my tried + true products! I really want to share more of my work outfits on here because I'm in workwear the majority of the time. And I don't mind it. I work in a corporate office where it's business at all times and I've never experienced that before, so it's been fun. One thing that I've been doing is figuring out to take pieces from my closet that may not typically fit the business appropriate bill and make 'em work. More on that next week. Another thing is color. Pink is my favorite color and while it'd be a rarity to find me in all black, it's quite common to see me in mostly blush. I found this pencil skirt and i knew it would be a versatile piece in my closet because I can wear it with cream or white, maybe a blush top and how pretty would taupe be? And I also just got a burgundy striped blouse that I would pair with it because this is a good skirt to mix prints with! Even though business attire isn't my everyday ( no cut-off's or unicorn tee's ) I never wear anything just to be work appropriate, I always like what I wear and feel like myself. And I try to buy things I can intermix with other clothes, loose blouses, fun dresses, and neutral sweaters! I drive through downtown Tampa everyday and I always admire this rose gold building. 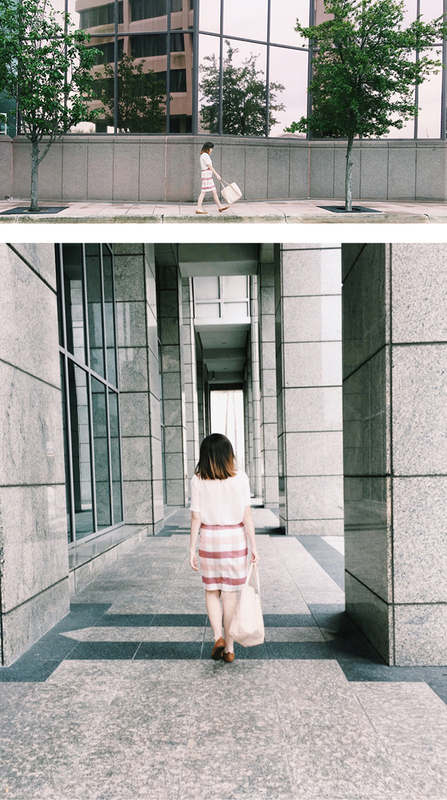 It's actually the Wells Fargo building, but it's the best shade of rose and was the perfect backdrop for this outfit. I was so nervous to do outfit photos downtown because omg all the people. But it wasn't so bad. The key is to find a quiet area and if cars are driving, which is inevitable because Tampa is busy, just ignore and keep going! My glasses and exact loafers (the first pair) are linked below. 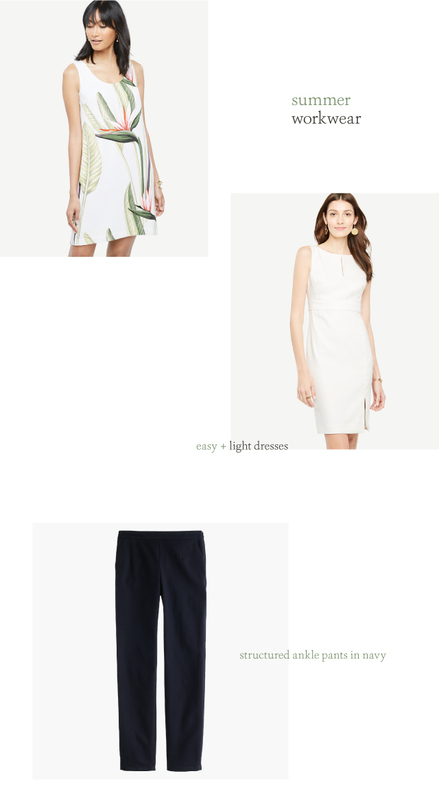 The skirt came from Ann Taylor Outlet, but I linked some similar options, as well as some blush totes and chiffon tops! I am not the most active person, nor am I athletic, coordinated, or motivated to take time out of my day to go a gym and work out for any given amount of time. I know that sounds negative or bad, but I used to be a horseback rider. I would spend hours riding horses or doing barn chores and I think part of the reason why I not only loved it, but continued with the sport for so long, was because I was outside and I could always relax more with the open space. I stopped riding because I was no longer working at a barn and I was going to school for graphic design in Savannah. But honestly if I wasn't riding, I really wasn't doing anything else active wise. I had been wanting to try something. I started getting migraines about halfway through school and it was suggested to do something active, but I had no idea where to start or what I wanted to do, so nothing ever really stuck. Fast forward to this past May and my friend Lori and I were talking about yoga. We decided to try Yoga with Adrienne's Revolution playlist. It's 31 days of daily 30 minute videos and people of any level can do it! It was amazing! And I actually stuck to it. I think part of it was having someone to do it with. Everyday, Lori and I would text, call, or even snapchat when we would start or end yoga. Just doing gave us something to look forward to, but it also made sure we did it! This is youtube. I do yoga on my own time, alone, outside by my pool. Just being able to take the stress out of having to make it to a class or not having to go to a gym automatically makes me more willing to workout more. I love doing yoga by my pool. It's so quiet and calm and I either do it in the morning if I have time or in the evening after work. No pressure. Strength. I've already gained a little bit of muscle tone and it's only been a little over a month. My goal is to be able ride horses again one day soon and yoga is definitely helping to build my strength back up. 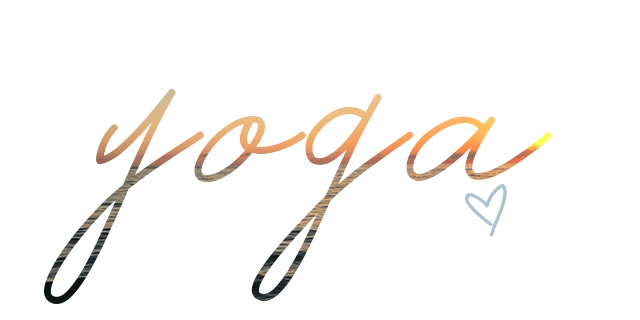 Thank you downward dog and all the planking/lunges/squats. I cannot wait to keep going! I think I'm going to do Yoga Camp next! I highly recommend Yoga With Adrienne, she has videos for every situation and she explains things well! This weekend we were over to Lakeland and found Florida Southern College. It was such an interesting campus with the Frank Lloyd Wright architecture and big beautiful palm trees all around the campus. There was also a huge lake in the center! So pretty! I don't wear a lot of purple but I love this strappy top, the pattern is so pretty and the back is really interesting! It's by a really fun brand called Flying Tomato and it's sold in boutiques, but also at Nordstrom Rack! And I noticed that a lot of their clothing had interesting details, which I love! It was honestly too hot for the jeans, but we were inside earlier and it was so cold from the AC that I was grateful I wore them. I also love the contrast of the dark denim with the purple pattern! 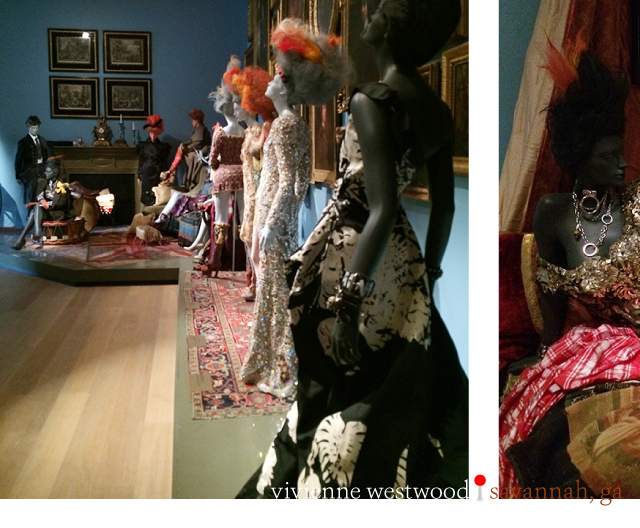 Back when I showed photos of the Carolina Herrera exhibit at SCAD, I think I mentioned that I also had photos of another fashion exhibition. These are some from Vivienne Westwood and I love the dark whimsy of them. The crazy hair, sparkle, the outfits! Exact opposite from classic Carolina, but I find just as much inspiration from this, which has been needed with all the craziness around here! I hope you enjoy looking at the photos as well. I know this is a short post this week, but it's been a bit of an adjustment. I'm figuring out a new routine with a new job :) and my days have just been SO busy! A white dress equals what to wear in summer. It can be one and done or you can zhuzh it up with colorful accessories! I love it with with neutral accessories so the dress can be on display or with color where the white is the canvas and the pops of brightness get to steal the show. I found this dress last summer in a boutique and I wore it to my college graduation. 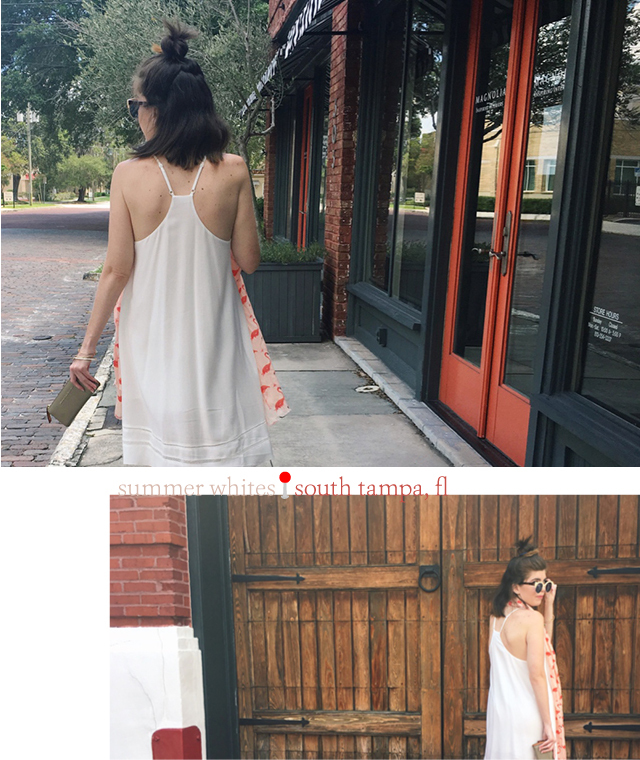 It was perfect for a hot Savannah summer, but I've been wearing it more often now! Last weekend, while going out to lunch, I added a bright sandal, a fun scarf, and I just took my wallet with me instead of a bag. One of my favorite things about working in corporate is the wardrobe. I love reworking my my favorite pieces and finding new outfit combinations! This is such a classic white summer dress and the blazer and loafers instantly transformed it into a work appropriate look! I know I'm about to state the obvious by saying that it has been SO HOT lately. Like you step outside and the heat just overwhelms you. 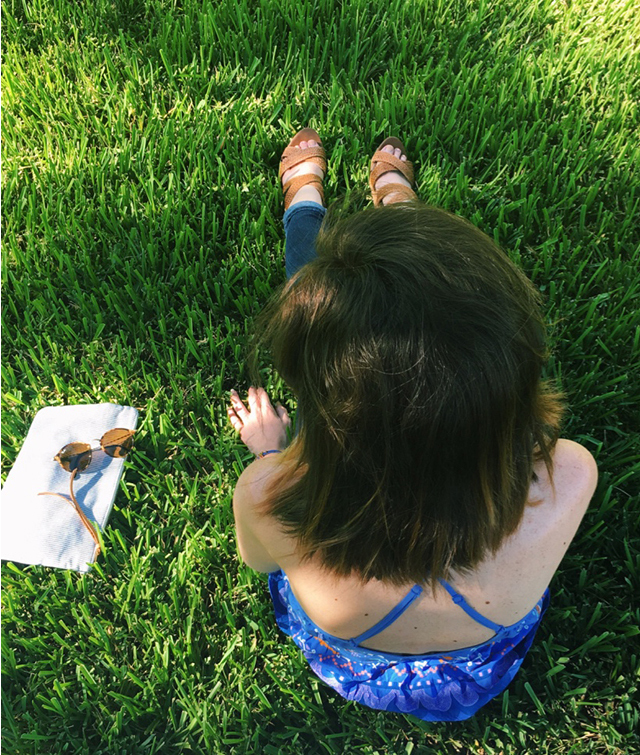 I am someone who loves the heat, summer is my favorite season and by the time Florida's [ very ] mild winter rolls around, I'll be counting down the days until summer is back! But these 'it's 94 but feels like 104 degree days' are intense and oh em gee! However, I still like to get out of the house and for that, minimal clothing that is cute and breathable is the best way to go. 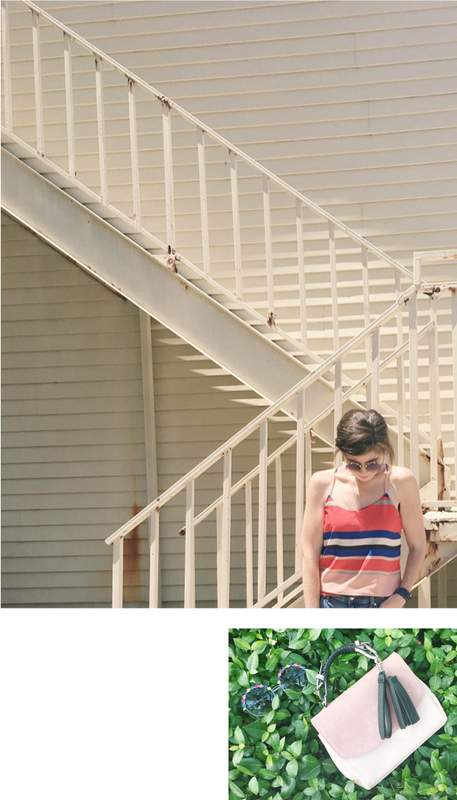 This silky cami from J.Crew Factory is perfect. It's the perfect weight, strappy, versatile, and ideal for warm sweltering days! They even have a scalloped version this season! So cute! I paired it boyfriend-fit cutoffs, but it would be so easy to dress it up with a flared skirt for night time or with dark denim and a navy blazer for maybe a more casual business lunch? 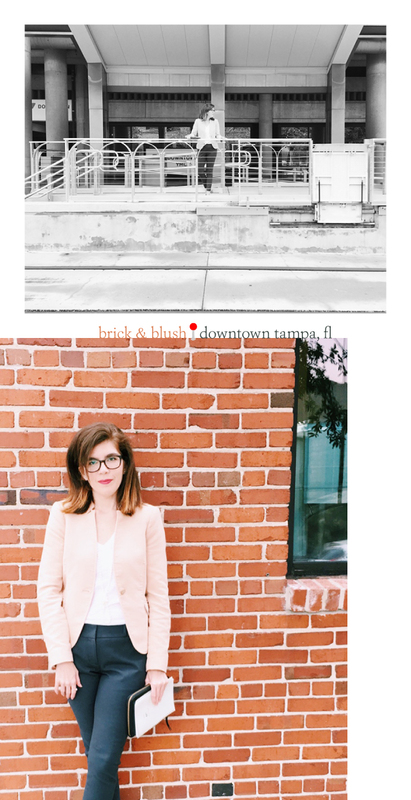 South Tampa is filled to the brim with charm and color, and it was so easy to find places to take photos when we went for a walk. 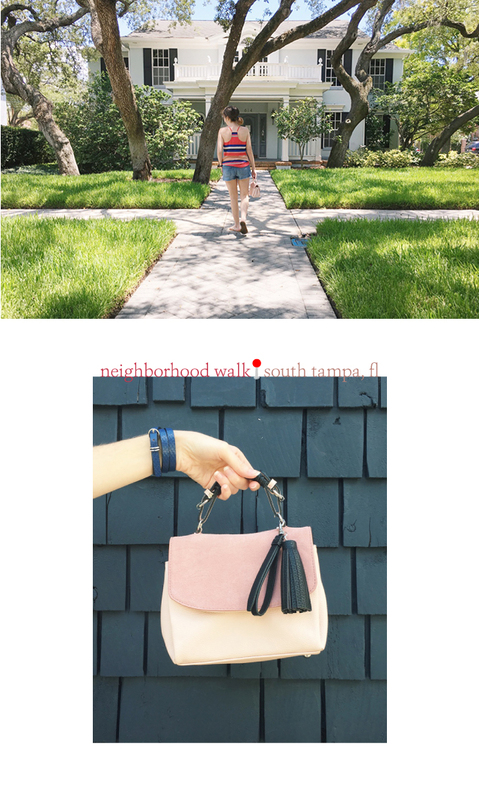 I am still pinching myself that I get to work in that neighborhood because I love finding all those cute spots! I hope everyone had a happy fourth! 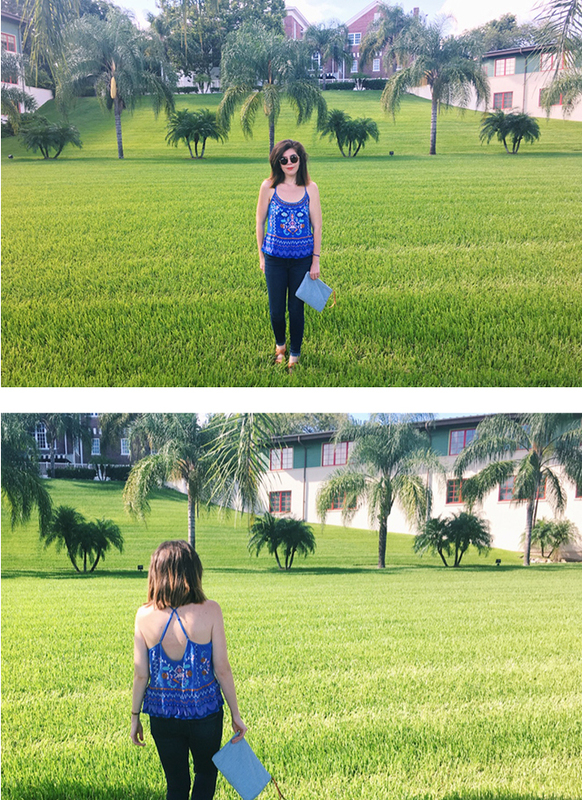 I finally spilled the beans, in an Instagram post, about beginning a new job (ahhh!) this month and it's in a small corporate office. They dress very professionally and while I haven't had the chance to really experience the office culture in person yet, I know I'm going to have to build up my office workwear. July in Florida is smoldering, but I know I'll probably get cold inside, however I still want to dress for the season. I love the idea of lighter colors, breathable fabrics, fun textures and patterns, and minimal accessories. Perfect for Florida and still professional. I also took inventory of what I already had in my closet and selected items that would work with what I had so that they would mix right into my closet. For instance, this palm print shift dress would be perfect with my favorite blush pink blazer with gold buttons that a friend gave me from Zara! I think shift dresses will be so easy because they are structured yet effortless and they happen to be my favorite silhouette. I also liked this sheath dress! I can see myself living in the Martie pant from J.Crew in navy because they're tailored yet comfortable and can be paired with everything from a white button-up to a fun shell top or a sweater! I really love this one! 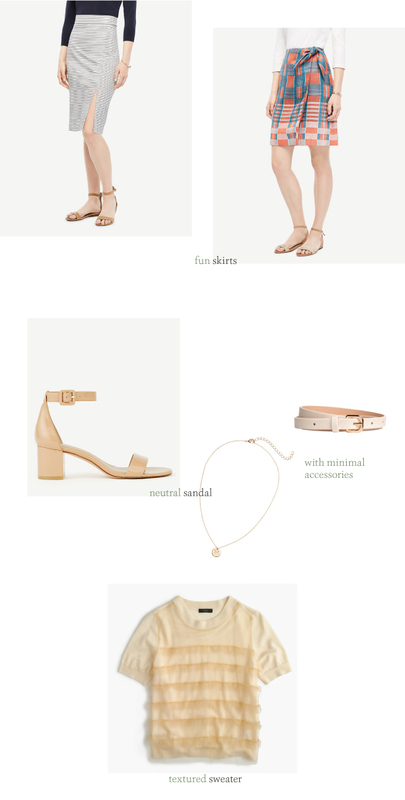 As for where I found everything listed, I think Ann Taylor has an amazing selection of professional/office appropriate picks and J.Crew has always been my go-to! H&M is great for more on trend pieces and accessories with a great price point! 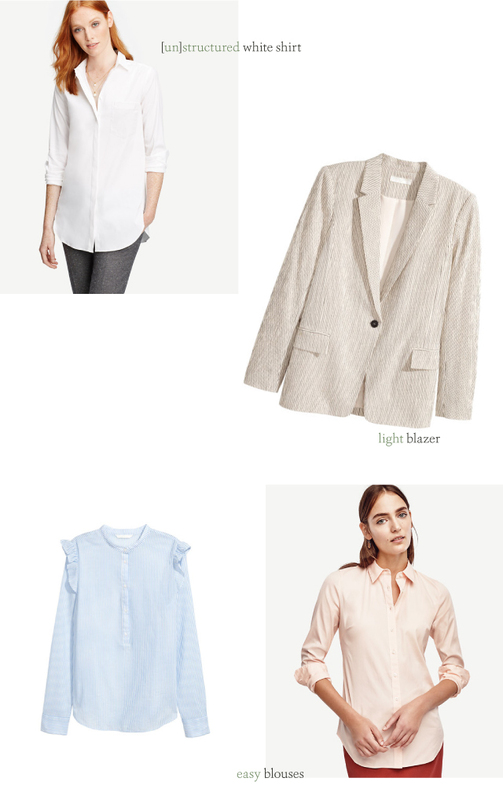 I would love to know what you think, what are some of your workwear staples?